It is with deep honour and gratitude that I thank all our UBUNTU members and supporters in over 144 countries, those who have embraced the spirit of UBUNTU and Contributionism and are spreading the message everywhere. A special thank you all those who have supported the UBUNTU office and our activities around the world with financial donations to keep us going, or donated their time and expertise, and so many more areas of support – you are the backbone and the heart of this movement. Our rapid growth and awareness would not be possible without your passion, support and sharing. I thank all the people that have joined the new UBUNTU management teams that have evolved in several countries and I look forward to establishing many more management teams in many more countries during 2017 to carry our message and implement our plan of action for a new social structure free from financial slavery. We have learnt a great deal over the past 12 years from our community project activations, to the political activity in South Africa, UK and Australia, and we are much wiser for all this experience. This year we will be focussing on launching our One Small Town plan in the USA, focusing on creating our first One Small Town in Brazil where we already have interest from such one small town. We hope to lay the foundation for our first One Small School – with a very different approach to learning and sharing knowledge – and we aim to launch the UBUNTU Conscious Music & Arts Festivals in as many countries as we can manage, to spread the UBUNTU message. I will be spending more time and energy on creating a strong team in South Africa and establish an active Youth Movement to carry the message to the schools and universities. Every day millions of people are waking up to the harsh reality that we have all been enslaved by this money driven system, controlled by a handful of global elite, but most people don’t know what to do to change it or escape it – welcome to the world of UBUNTU. We are manifesting our own reality – co-creating a NEW alternative for all of us because the socio-political system that has been imposed on us does not serve humanity in any way – it is broken, and it cannot be fixed. We are doing all this without any violence, resistance, opposition, or conflict, by simply creating a new system in which money will no longer have control over our lives. A world in which we can all live free from any form of enslavement – creating abundance and prosperity for everyone beyond our wildest imagination today. The collective consciousness is now rising so rapidly that the seeds we have planted over the past 12 years cannot be stopped from growing. 2017 will be a year of mass activation and awakenings by millions more who will be looking for answers and solutions to our problems. The UBUNTU Movement is here to show the new alternative for those who feel that that there is no hope or no way out. Keep reminding yourself that - We are the ones we have been waiting for – it is up to us to create the kind of world we would like to live in. Filled with love, unity, harmony and abundance on all levels of our human activity. 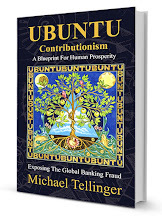 Now go out and tell everyone about UBUNTU and our simple plan to create a domino effect around the world. I can hardly express how excited I am about our beautiful future and I expect great things to happen in 2017. How great…it’s all up to us. In Love, Unity & Resonance with you and all of humanity.